Trump says he wants Israel&apos;s border wall. That means he actually wants smart fences. By Feb. 15, we will have either another government shutdown, a spurious national emergency declaration, or a deal on President Donald Trump's "big, beautiful wall" at our southern border. Ann Coulter helped prompt Trump to reject an earlier bipartisan border security bill, and declared: "I would like exactly what Israel has." Trump echoed her in holding up Israel's example: "If you really want to find out how effective a wall is, just ask Israel - 99.9 percent effective. And our wall will be every bit as good as that, if not better." Yet neither Trump nor his television muse appears to realize that Israel generally does not rely upon a wall. And when it does, it is only to combat direct terrorist threats in high-risk areas, not to stop migrants. In fact, a compromise would be to give Trump the "wall" he says he wants like the one in Israel - in other words, a smart fence. Democrats and Republicans flip all the time on border security. This was a fabricated shutdown. Forget Trump's border wall. We're looking at a management failure, not a security crisis. Israel faces security threats on its borders with Lebanon, Syria, Egypt, Jordan, Gaza and the West Bank. But Israel understands the costs, tensions and disruptions to civilian and economic life that walls create. The only concrete or steel wall akin to what Trump has called for runs along less than 10 percent of the West Bank border. It was built in response to a wave of bus bombings and stabbing of Israeli civilians on the streets, after the collapse of the peace process - that is, in response to lethal force used against its citizens. In the run-up to Israeli elections and after months of violent mass protests along the border with Gaza, punctuated by the capture of an armed terrorist who jumped the border fence, Prime Minister Benjamin Netanyahu just announced construction of a 40-mile galvanized steel barrier above its existing underground barrier to "prevent the infiltration of terrorists into our territory." This is nothing like the challenge of migrants from Central America; they are overwhelmingly seeking safety and security in the United States, not opportunities to harm us. 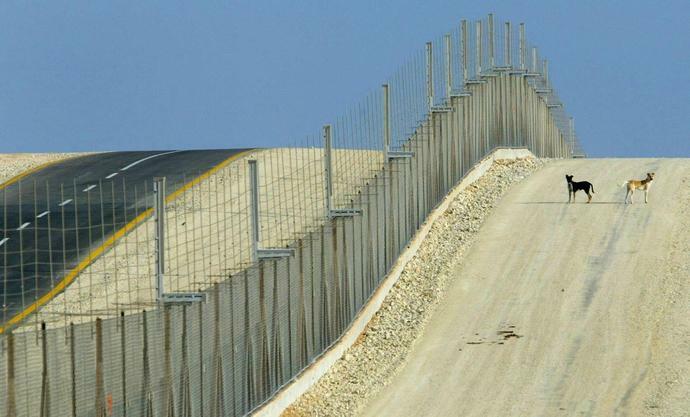 The rest of Israel's borders are protected by fences generally 5 1/2 yards high, ground radars, electromagnetic sensors, electro-optic cameras and underground barriers that seal off terrorist tunnels from Hamas radicals in Gaza and Hezbollah terrorists in Lebanon. No comparable security challenge faces America at our southern border. The most recent State Department terrorism report concludes that "there was no credible evidence indicating that international terrorist groups have established bases in Mexico, worked with Mexican drug cartels, or sent operatives via Mexico into the United States." Last week, the largest ever fentanyl bust by U.S. border officials occurred at a legal point of entry in the false floor of a truck, not on the backs of migrants. In the just-released Worldwide Threat Assessment issued by U.S. intelligence agencies, the southern border is not cited as a security threat, and no wall was recommended. The United States already has steel walls and fencing along 654 miles of the 2,000-mile border with Mexico, and only about 350 miles of it blocks pedestrian traffic. Discussions of securing the border ramped up in the early 1990s in the Clinton administration to prevent drug smuggling, and 2006 bipartisan legislation passed under President George W. Bush called for a double fence across the entire border. The Department of Homeland Security convinced Congress this approach was infeasible, unaffordable and ineffective. Led by Republicans, in 2007 Congress amended the law to allow for investment in technology and manpower as well as some fencing, based upon expert analysis. In 2010, President Barack Obama halted construction of fencing and reallocated the money to upgrade border technology, again based on analysis of what works. The area most analogous to the our southern border is the desert border separating the Egyptian Sinai from the Israeli Negev. Here Israel faced a migrant crisis that mirrors what the United States is dealing with now. Starting in 2008, thousands of Africans from Eritrea, Sudan, Ethiopia and Somalia made a dangerous trek across Africa that is similar to the one Central Americans make through Mexico to reach the U.S. border. They were largely economic migrants, although many were also fleeing violence at home and might qualify for asylum status with a "well-founded fear of persecution." Eventually, the number of African migrants swelled to almost 65,000 in a country of less than 9 million. Netanyahu ordered a fence enhanced with electronic devices (not a concrete wall or steel barrier) along the 150-mile border between the Egyptian Sinai and Israeli Negev. Even that was built over the Israeli military's objections that it diverted funds from more pressing security concerns. This electronically enhanced fence with additional guards cut the migrant flow from 16,000 in 2011 to fewer than 20 in 2016, a 99 percent drop. If Trump really wants to emulate Israel's border security, it is this example he should study. Congress and DHS recognized after passage of the 2006 Secure Fence Act the reality Israel had already learned - that real-world conditions such as daunting terrain, flood plains, private land ownership and a lack of road access make an unbroken barrier cost-prohibitive, legally challenging and unnecessary. Congressional negotiators could help break the logjam by allocating more than $5 billion for border security, as Trump seeks, and directing that it pay for Israeli-style fences and technology such as ground radars, sensors and electro-optic cameras, as well as more border patrol officers, customs agents and asylum judges. Whether this type of compromise can be reached - drawing upon the lessons from Israel's approach - will be a test of whether our democratic system and this administration can produce evidence-based bipartisan results on tough issues. Stuart E. Eizenstat, President Jimmy Carter's domestic policy adviser and author of "President Carter: The White House Years," served in the Departments of State, Commerce and Treasury during the Clinton and Obama administrations. His posts included U.S. Ambassador to the European Union, Special Representative of the President and Secretary of State on Holocaust-Era Issues (for Bill Clinton) and Special Adviser on Holocaust-Era Issues (to Secretaries of State Hillary Clinton and John Kerry). This article originally appeared on USA TODAY: Trump says he wants Israel's border wall. That means he actually wants smart fences.